Logan Thomas had a rough time last week. Bowling Green returns an outstanding 20 starters. That includes third year starter QB Matt Schilz, who threw for 3,000 yards last season for a Falcons team that went 5-7 and posts a 3-5 record in the MAC. They also return leading rusher sophomore Anthon Samuel, who ran for 844 yards last year as a true freshman. He also had five 100+ yard games and five TDs in nine games. Samuel was held out of spring ball with a wrist injury, but is expected to be fully healthy for Saturday’s matchup against the 23rd seeded Gators. Sophomore Jamel Martin will be able to backup Samuel should he be reinjured or if he needs more time to reach full strength. College football oddsmakers don’t think that will make much of a difference for the Falcons, setting them as underdogs to the tune of nearly three touchdowns. The OL had trouble staying healthy last year, so that will be a key to the Falcons reaching the 7-5 projected record by Athlon magazine. They have a lot of capable linemen though, and five of them started at least six games last year. WR could be a problem because they graduated six wideouts. Junior Shaun Joplin is the lone returning player who could actually make a big difference. The passing offense was okay last year, with the Falcons ranking 5th in the MAC with 261 yards per game. Their total offense ranked 6th in yardage with 384 per game. Michigan transfer Je’Ron Stokes had only three receptions in two years with the Wolverines, so his impact may be minimal, while Alex Bayer will get his fair share of receptions at TE, with 20 last year as the main starter. Against the 2-1 Toledo squad, Bowling Green dropped the game 27-15. They gave up 303 passing yards to Terrance Owens in Toledo, Ohio. Samuel still rushed for 112 yards on 16 carries with a TD. They’ve now dropped three straight to Toledo. Bowling Green was just four of 13 on third down conversions and just one of three on fourth down conversions. Their time of possession was 28:10 and Schilz threw an interception. Falcons are 6-1 ATS in their last 7 on grass, 22-10-1 ATS in their last 33 on the road, 2-5-1 ATS in their last 8 road games vs teams with winning records, 2-5 ATS in their last 7 after allowing 450+ total yards previous game and 1-4 ATS in their last 5 after scoring less than 20 the previous game. Virginia Tech has come out of the gates 2-1. Week one victors against Georgia Tech and week two victors against Austin Peay, they came back last week to drop to the Pittsburgh Panthers 35-17. It was a nice rebound for a Pittsburgh squad that had already suffered an SU defeat to Youngtown State and then was destroyed on the road against Cincinnati. It will take a much more focused effort on Thomas’ part himself to avoid a meltdown against a team that they should handle pretty easily. College football oddsmakers have set the line 17 points in Virginia Tech’s favor, and it will be up to the Hokies to make sure they get more from Michael Holmes in the back field. He’s carried it 31 times, but is averaging just 3.2 yards per carry, for 100 season yards. He does have two touchdowns, but should be good for two more just this week, if the Hokies go to him as much as they should as their featured back. Hokies are 5-1-1 in their last 7 after allowing 200+ rushing yards prev. game. 9-2 ATS in their last 11 vs the MAC, 3-7-1 ATS in their last 11 following an ATS loss. 0-7-1 ATS in their last 8 home games, 0-6 ATS vs teams with losing records, and 3-12-1 ATS in their last 16 overall. Want to crush the bookies? 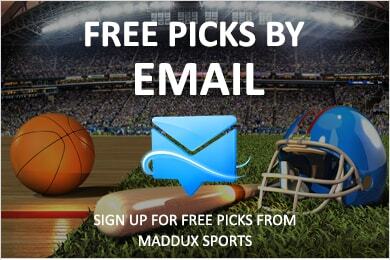 Make sure to check out our paid pick plans for the 2012 season. Our handicapping team has an excellent track record of lining people’s pockets, so get in on the gravy train!